A new version of sea-surface temperature data corrects some bias due to the different methods to measure water temperature, either with non-insulated buckets, insulated buckets and engine intakes. However, the global sea-surface temperature history still raises many questions. 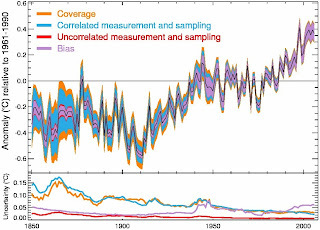 1961-1990) showing the cumulative eﬀect of adding diﬀerent error components (coloured areas): median HadSST3 value (black) 2-sigma uncertainty arising from assumptions in bias adjustments (purple); measurement and sampling error, assuming these are uncorrelated between grid boxes (red); and the uncertainty including the intergrid box correlations (blue) and the total uncertainty including all the above terms and the coverage uncertainty (orange). The lower panel shows the sizes of the individual components as 2-sigma uncertainties. 1) The sea-surface temperature has clearly risen from 1900 until today by roughly 0.9 K. The main question here that any scientist would like to answer is what are the factors or combination of factors that have caused this warming. Note that even if temperatures had been much higher in , say 1800, even much higher than today -which I doubt - this question would remain. We see a change and we have to find an explanation for that change. Now imagine that temperatures had remained constant at 17 C over the whole 20th century. The question would then be why global mean SST are 17 C. In both cases there is a question to answer, and the explanation should involve known physical processes. By this I mean among other things that, for instance, 'recovery from the Little ice ' is not a known physical process that is described by any known equation. Also, natural oscillations are not a known physical phenomenon per se. If there is a 'natural oscillation' there is something that oscillates and for some reason. What is that and what makes it (quasi) oscillate ? Neither is an answer of the type 'it was warmer in the Medieval Warm period, so I dont care' permissible. I think t we all should require physically consistent explanation from any theory of climate change, and not only from the anthropogenic greenhouse effect . 2) The increase has not been monotonous monotonic though. If we would set up a poll among our readers to define different phases in the history of SST, I am pretty sure that all would come up with the same ,o r with a very similar answer: cooling up to 1910, warming up to 1945, cooling up to 1975, warming up to now (here some would argue that the last 10 years SST has been stable, but we want to focus here on the 20th century development). This is a second question that also needs an explanation. There are some around, involving a combination of external climate forcings and internal quasi-oscillations. But what it is really striking - I think- is the fact that these warming and cooling phases are so sharply defined. The figure above shows annual mean values, but I venture to think that if we had the monthly mean values we would even be able to pin down the months in which the trends flip. To state it provocatively, we could perhaps identify the month in the year 1910 in which global warming began. Considering that these are globally averaged data of a quite complex geophysical system, measured with some error range, I find this truly remarkable. All of us would tend to think that at these large spatial scales, nature should behave more more smoothly. 3) The warming trend between 1910 and 1945 is quite similar to the warming trend between 1975 and today, 0.6 K in 30 years, although the external forcings have been qualitatively and quantitatively quite different. Maybe it is just a fluke, or maybe SST for some reason can only increase at a maximum pace, shovelling all heat flux above a certain threshold to the deeper ocean. Anyway, adopting an agnostic uninformed point of view, a simple extrapolation of these trends in the 20th century into the future would already result in 1.8 K warming of SST between 2000 and 2100. A minor translation quibble. "Monotonous" should probably be "Monotonic." If I was a scientist, I would worry much more about the "cooling up to 1975" and about the lost heat in the Abyss from the "warming up to 1945". I would also worry about the normal state and evolution of the climate without any anthropogenic forcings. If there was a MWP, which was probably exactly as warm as today in those parts of the world where we have reliable data, I would like to find out why. And if my fellow climate friends had found a mechanism explaining the warming, where the feedbacks are much larger than the original anthropogenic warming, I would be very surprised and question this mechanism by every means. Note the ocean surface isn't water to a biologist -- the sea surface temperature record is measured right in a very thin worldwide ecosystem only beginning to be described, one in which quite complicated signals coordinating activity are present. "... the upper-most 1 mm of the ocean, .... the sea-surface microlayer is a unique habitat that is often referred to as the neuston.... activity within the microlayer can mediate the air–sea flux of other gases, such as methane (Upstill-Goddard et al., 2003)." "Chemical signaling processes in the marine environment"
"... chemical signals released into the environment ... biological responses to these stimuli .... quantification of interactions between hydrodynamic, chemical, and biological factors at numerous spatial and temporal scales. "Quorum sensing (QS) .... may impact the timing and magnitude of biogeochemical fluxes in the ocean." "... Information regarding two social phenomena exhibited by bacteria, quorum sensing and biofilm development .... two areas in which microbiologists focus on social aspects of bacteria.... represent a small part of the social repertoire of bacteria. Bacteria exhibit many social activities and they represent a model for dissecting social behavior at the genetic level. Therefore, we introduce the term ‘sociomicrobiology’." You can't, I suggest, assume that taking sea surface temperature measurements gets you purely geophysical measurements; you're measuring a temperature affected by a living ecosystem that occupies the ocean/air interface and communicates over large distances. Same reason doctors will observe the human temperature at the skin but take measurements internally; they're looking for a 'core' temperature not the temperature at the interface between very different parts of an actively changing system. Just amateur thinking here, it may not be a very strong effect, but if it's nudging the temperatures slightly one way or the other in a coordinated fashion, it might explain the changes observed. very interesting indeed, thanks for the post! Short term fluctuations left aside the change in SST is caused by energy imbalance of Earth. Of course, for calculations one would need data from the whole ocean, not just surface. Most of the feedbacks are independent of the forcing because they are mediated by temperature. For instance, the water vapor feedback occurs because with warmer temperatures the atmosphere can old more water vapor that is a greenhouse gas on its own. Here it is not important that the initial temperature perturbation was the sun or CO2. So, if strong feedbacks can amplify the effect of the sun, these feedbacks would also amplify the effect of CO2. With one exception, to my knowledge. This exception is the Svensmarsk mechanism by which the cosmic rays modulated by solar activity could influence cloud formation. CO2 would not be involved in this feedback. Other than this one, I think that all others would operate similarly in a first approximation. The temperature perturbation caused by the sun and CO2 may follow different spatial and seasonal patterns and this may introduce a difference, but I would say these are second order effects. yes, energy imbalances are reflected in the ocean-average temperature. That is why sea-level rise is important not only as a climate impact, but also as global diagnostic tool: sea-level rise implies energy imbalance (disregarding the artificial effects of water mining and reservoir building, and the crust adjustments). This is one of the main arguments defended by Roger Pielke Senior, heavily contested by realclimate. You may be unwittingly drifting to dangerous grounds ..:-) ..
For that reason, amonst many, your answer is keep hoping. as the IPCC writes in the AR4, 1.4 W/m2 went into the tropical ocean in the 90s directly due to cloud radiative forcing. There is a big chunk of your imbalance. You find such a sharply defined behavior, you describe, very often in nature, while you observe subsequent phase transition during heating. This always strikes me and therefore I think sea ice is involved. No, it's only dangerous ground, if I would regard surface stations record as worthless. yes, phase transitions are a good example of discontinuities. Maybe they play a role here. However, ice-covered regions are relatively small. Also, natural oscillations are not a known physical phenomenon per se. If there is a 'natural oscillation' there is something that oscillates and for some reason. What is that and what makes it (quasi) oscillate? Wasn't there an experiment with a atmosphere-ocean model showing that an unforced model run with a white noise atmosphere leads after some time to red noise variations in the ocean including oscillations? Assuming this is true: The whole model/system would follow physical equations. But the behaviour that a white noise atmosphere causes a red noise ocean cannot be described by an equation but through the interaction of myriads of physical equations. I don't know if it might be possible to reduce the global SST question first to e.g. a "pacific warm pool" question? Wasn't that a dominant factor for the whole temperature? Quite difficult questions to me. Didn't find the experiment right now. Was somehow related to the "stochastic climate model" after Hasselmann (1976) and the experiment was with a simplified model partly similar to Noise-Induced Transitions in a Simplified Model of the Thermohaline Circulation - however not related to the THC. This study suggests that noiseinduced transitions might have climate relevance. It's exactly this beauty of the concept of the stochastic climate model which led me on the thin ice. However, with ...cannot be described by an equation but through the interaction of myriads of physical equations I meant a physical equation / process here. Using an AR(1) process here means that we describe the behaviour of a system in terms of statistics rather than physics. Or in other words we describe the time(-scale) dependent behaviour of physical processes (e.g. using different kinds of noise) but not the physical processes themselves. an AR(1) process may be considered physically motivated, because it describes a system, in which the temporal change is proportional a negative (stabilizing) feedback. Simplest physics. When you make an linear "Ansatz" you often will start with this. phantom?" by Vincze and Jánosi. http://www.nonlin-processes-geophys.net/18/469/2011/npg-18-469-2011.html published these days in Nonlinear Processes in Geophysics. The results are certainly not surprising, but it's always good to be reminded of these fallacies. If or how far could sth. similar to the observed (quasi-)periodic SST variation superposed on a trend over e.g. 100 years be found in an unforced AOGCM simulation? I think that s stochastic climate model a la Hasselmann can be useful to heuristically explain some observed phenomena, for instance that the spectra of many climate series are red. One even can design a stochastic climate model than produces very long runs of temperature trends, for instance assuming a long-term-memory process instead of an auto process. However, they cannot physically explain why this happens what phenomena are involved in those long runs. Another example: one can describe the annual cycle by assuming a deterministic sinusoidal model with some white noise superimposed. Bit the real physical causes are missing in the model. By the same token, a long run of trending surface temperatures and sea-level requires that the earth is accumulating energy, and thus one has to explain where this energy came from. was it because the input has been increasing (solar forcing) or because the energy losses have been decreasing (e.g. less clouds or stronger greenhouse effect) ? This was the reason why I tried to make this separation in #22. In the case of red noise in SST in an unforced system - you find also periods with trends over a limited period (maybe not longer than 30 years?). So where is this energy coming or going to? Just internally redistributed e.g. from deep ocean to mixed layer and later back? Unforced system? probably you mean 'constant forcing'. The Earth is always an open and forced system and thus it can change the amount of energy it accepts from outside without changing the external forcing. For instance if cloud cover increases, it reflects more incoming solar radiation back to space. The nonlinear interaction between temperature and cloud cover - both influence each other- can lead to internal variability. The amount of energy entering the system also varies although the external forcing- the sun- is constant. why was the SST warming during the 1st half of the last century as fast and large or. even larger and faster then the actual warming? What could be the time scale the effect of cloud-temperature interactions would be zero on average in a control run? Years, decades but not more? I was just wondering how the ocean (re-)acts e.g. on the cloud-temperature interaction when constant forcing is used. In case of only some years the ocean would not react. On decades, it might react and lag then behind for some time. As trends over some decades even show up in the control run: Where is this energy coming from or going to? Just the variability of accepted total energy from space? Or is it also due to redistributions within the ocean layers?